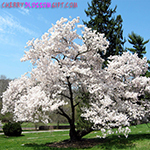 Order your official live Japanese Cherry Blossom Trees today. Seedlings are shipped approximately March 1 through April 15. 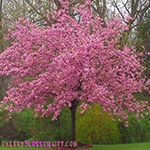 We currently sell Kwanzan, Yoshino, and Weeping Cherry blossom tree seedlings. Supplies are limited. 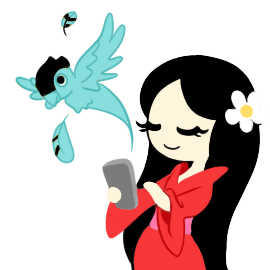 The Japanese 'Okame' Cherry Blossom is one of the most delicate and finest flowering trees found around the National Mall and Tidal Basin located in Washington DC. The Japanese Yoshino Cherry tree is a hybrid cherry of unknown origin. It occurs as a natural hybrid in Japan and is now one of the most popular and widely-planted, cultivated, flowering cherries ("sakura") in temperate and semi-temperate climates worldwide. Natives of Japan, weeping cherry trees have long, drooping branches similar to weeping willows. 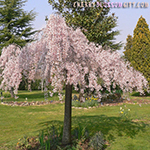 In the spring, the Weeping Cherry is covered in white or pale-pink blossoms. This handmade paper tree is embedded with Cherry Blossom seeds. Store the tree in the refridgerator until ready to plant. Soak the paper in cold water, then plant under 1/8" of fine soil, directly outdoors in late summer.